I still have an ash tray 'borrowed' from Figlio's. It requires a willful effort to be contrarian about Autoworld's history, but I'm one of those few locals that greatly regrets that the physical facilities weren't converted to a medium-sized regional exhibition hall and convention center. 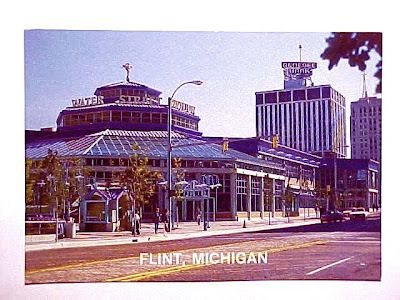 Soon after I moved back to metro Flint, I had some communications with the then-newly-hired head of the Flint Convention and Visitors Bureau about how he had been hired to implement just that plan, and how notwithstanding the suitability of the buildings and the existence of sufficient market demand, it was not happening due to endemic local pessimism. My guess is that if Autoworld had become a regional convention center, and the UM expansion had instead been integratively planned around it onto the expansive property to the existing buildings' north and east, Water Street Pavilion would have been a success instead of a failure. I went to Powers H.S. in the mid-1980's. With Water Street, Windmill Place, Shoe Store Parties and the Rusty Nail I think we believed we were really cosmopolitan. Yeah, JWilly - I agree, Autoworld... what a waste. It had an IMAX theatre and everything... Convention center would have been great... or any type of U-M facility... a friend of mine who had seen it thought it would make a great building for a film school... what did the city consider? A casino... and what did they actually do? Sell it to U-M for a dollar, who turned it into a PARKING LOT. Sorry about the caps, but parking lots are a pet peave of mine. 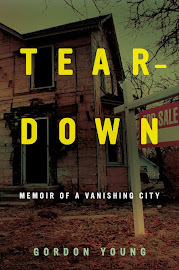 The historical decisions of the people who have run downtown Flint were just pathetic. That "endemic local pessimism" is still around today... just look at what options there are for the Flint Central High School building. Autoworld needed to go. UM Flint will get the rest of that area filled up one of these years, we've got more pressing problems. Such as, for instance, seizing the Genesee Towers by eminent domain, imploding it, and combining it, the old Journal building and that huge, ugly flat parking lot at Saginaw and Kearsley into a New Urbanist Utopia. I also have my silver Water street jacket! I'm gonna wear it this fall! Whenever I hear Autoworld I think of the IMA Autotorium. Did'nt Autoworld sit on the same grounds that the IMA was at? When I think of the IMA I'm reminded of the Shine Circus. Also my first concert was there...REO Speedwagon in 1978. Acapolco gold was the flavor that season. Heart came to play there next, (back when Ann & Nancy Wilson were still skinny and pretty). Does anyone remember the folding chairs that would sit on the main floor. Those were good seats/stand-ons. "Did'nt Autoworld sit on the same grounds that the IMA was at?" The AutoWorld complex consisted of the original IMA Auditorium building, gutted and rebuilt to its new multifloor purpose; part of the IMA Annex building; and the new dome-building. I worked at Ruggero's at the same time you were at WSP. I remember dear Rosie so much. Bless her heart. God bless you for giving her joy while she was on this planet. I did not know until a few years ago she had been killed by a driver while waling across a street. You ought to post those videos on YouTube. I know alot of people in Flint and former residents like me would love them! I saw Rosie at a bar called "The PepperMill Underground". You went into a basement somewhere in downtown Flint to get there. Everyone went wild when she sang "Won't you come home Bill Baily". Having watched "Roger & Me", the place comes off more like what happened with "Portside Festival Marketplace" down here in Toledo, stayed around for a number of years and then it was gone. At least Portside suffered a better fate as a children's science museum today (of course that almost closed as well without public support). My parents owned Steak of the Art which was a Philly Cheese Steak place inside of Water Street until it closed in 1988-1989. I have great memories of hanging out there and filling soda cups for the customers. We used to hang with the other restaurant owner kids and run around in the shops upstairs. In 1989 we relocated to the Lansing Area and my parents went to work in the school system there.